Greetings. 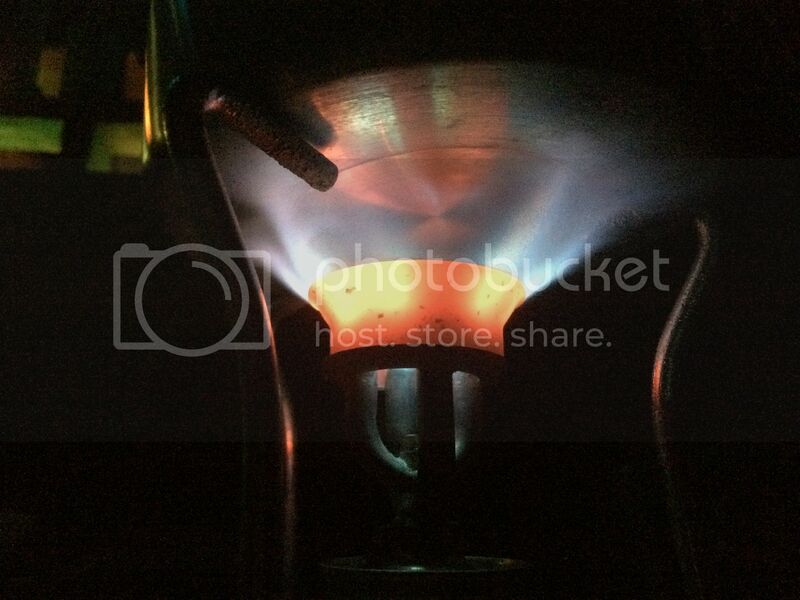 I've been testing a kerosene stove recently. It was manufactured in Mumbai, India by a company known as Palam Stove Industries. With the unfortunate closure of St. Paul Mercentile, which was an importer of the butterfly range of kerosene pressure stoves there has been a vacuum in the area of affordable kerosene pressure stoves for preps. The Liberty 'Rocket' brand stoves are being imported by A&H Enterprises. A&H is a long time sales and service supplier for pack able and marine stoves. When I learned that it was the A&H eBay store I was dealing with I was immediately more confident. I have been dealing with A&H on and off since the mid 90's and I have always been pleased with the service I've received. The rocket #0 is patterned after the optimus 00 stove. It is a mid sized pack able stove with a fuel capacity of 1/2 liter of kerosene. While I don't have an exact btu rating on the burner, it has a very practical heat output. It is also very adjustable via the air bleed screw to allow fine simmering. I have taken the stove out on two occasions. Once in early June on a car camping trim and most recently last night to a birthday party overnight where it was put through much use brewing coffee and boiling cocoa and tea water. The stove functioned flawlessly, and performed equally well to name brand stoves that cost two to three times as much. I recommend this stove because of its simplicity and value. The stove is currently for sale on eBay for $75 including shipping. While I am not explicitly recommending using this stove indoors, I will point out that stoves of this design were routinely used indoors safely for years. As always, be sure you use common sense whenever using a combustion device indoors. Make sure you have adequate ventilation, be sure the appliance is operating properly, and be sure to have at least one, but preferably several battery operated CO detectors nearby. After operating this particular unit several times in the field as well as on test runs, I would feel comfortable operating this stove in my home. Ymmv. This of course will expire, but if you click 'view re listed item' you'll get pointed the right way. If you decide to get one of these I highly recommend getting aquatinted with how it works before storing it away. Be sure to do this outdoors. If any problems arise due to manufacture etc... Contact A&H. They will take care of you. The quality of my copy is excellent, but this item is manufactured largely by hand by skilled workers. There is always the possibility that human error will occur. A&h is selling several other model stoves by the same manufacturer. Of particular interest is the rocket model 100 which is similar to the optimus 45. It uses the same burner as the model 0, but with 1 liter size fuel font. I have not tested one of these yet, but I plan to do so in the near future. At $60 without a case the model 100 may be even more ideal for caches and bug out locations. Keep an eye out for a review. There is also the possibility that A&H will begin selling kerosene pressure lanterns from this maker. Again, if I get a chance to do a review I will. I do not work for A&H and I bought this item myself. "A rifle behind every blade of grass?" "No, but any blade of grass"
New Production Kerosene Pressure Stoves!!! 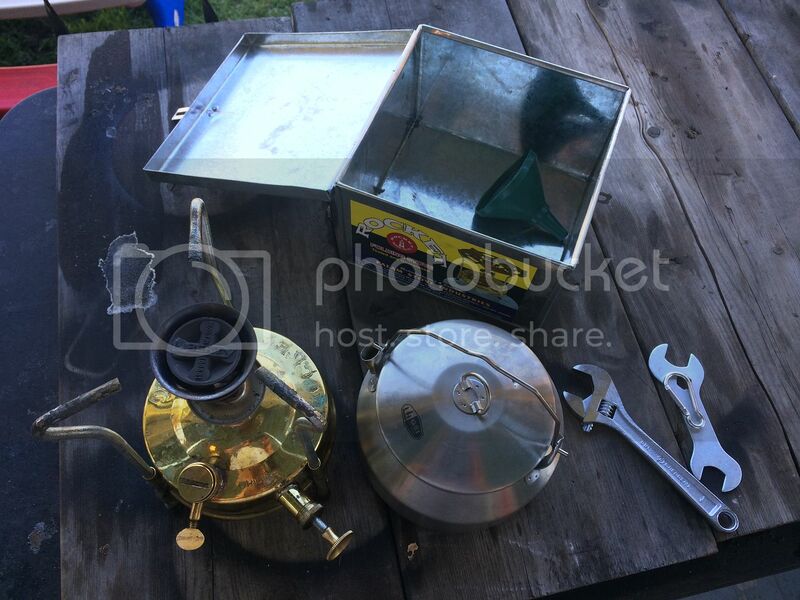 The A&H site doesn't show the #0 stove - it does show a #1 stove with a larger font. Neat that the A&H carries the silent burners for a very decent price point. I was surprised to make the connection between A&H and the eBay seller 'bella10202.' I assure you that everything being sold under that user name on eBay is being sold by A&H. I have noted that the eBay offerings often do not match the A&H web site. I don't know why that is. OTOH, kerosene has much more BTU than white gas which means that you can cook longer with the same amount of fuel. 1) Try to shield the priming flame from wind. You want to do this anyway, but an incomplete prime will yield poor results. Some stoves of this type have a priming windscreen. The liberty 0 does not. In a light breeze I just cup my hand six or so inches from the burner on the wind side. You want the priming flame in contact with the burner tubes. If it's missing them it's not working. Also there is no law against double priming. Just be careful in case the alcohol flashes. For preps it's not that big of a deal to put a gallon of alcohol by. It will go a long way using it only a tablespoon or so at a time. Dual priming fuels are a big turnoff for some people. Especially if they're carrying it. These stoves historically would come with a small priming bottle. In modern times any lightweight alcohol bottle will do fine. It worked for arctic explorers. It worked for Himalayan expeditions. In any event my friend Berniedawg has an excellent video about priming a 00. Redbad wrote: OTOH, kerosene has much more BTU than white gas which means that you can cook longer with the same amount of fuel. It's also far cheaper. I buy clear kerosene at any one of my local gas stations for less than $5/gallon. I would say that you should try yellow bottle HEET or denatured alcohol to prime your dragonfly. Personally I just use coleman fuel when backpacking. But in my preps I'm set up for kerosene to cook light and heat. So I stock alcohol. If you ever wanted to light that dragonfly indoors... I'm not telling you it's perfectly safe... But if you ever wanted to... Priming with alcohol is by far the cleanest way to go. I would suggest looking for a Coleman kero lantern, or even convert one with the kero generator or even consider a Garret-Wade (NATO certified) lantern. The difference in quality can be significant. I've purchased several Coleman lanterns for 40 to 45 dollars that were new in box, and I live in Alaska! A Coleman mod 220 or 220A can be converted to a kero burner for about 30 USD. I've done a 288 conversion using a 214 generator. It performed flawlessly in my initial tests. But it started pulsing badly on my first trip out with it. This was a few weeks ago and I haven't had a chance to look into it further. Evidently there is a possibility that A&H might start carrying rocket brand kero pressure lanterns. If so I will very likely pick one up and do a review. Just an update; I did order one of the model 100 stoves ($60) and will be doing a compare/contrast review within the next week. Here I do the comparison of the two stoves vs the omnifuel. Also since my original post St Paul Mercantile is reopen under new management. They have the butterfly stoves in stock. At some point this summer I hope to do a comparison video. At the outset however the old volume pricing that St. Paul did is no longer in effect. Thanks for posting this. I didn't even know there was such a thing as a kerosene pressure stove. I'm well-stocked on kerosene lanterns; it seems only logical to pick up one of these as well. Here is a history of primus. These Indian made stoves are essentially copies of the original primus design. The idea was to make a 'sootless' burner for kerosene. That same seller (A&H, aka bella10202) is offering some lanterns made by Liberty, the "Tempo", for $75. Looks like another Petromax clone? Has anyone checked them out? $75 seems mighty cheap for one of these lanterns; the aforementioned St. Paul Mercantile charges $109 for the Butterfly (though including a shade). My Googling doesn't turn up any other mention of the Tempo. Me, I'm not sure I am - my Coleman kero lantern might be all the complexity I'm willing to put up with. That St. Paul mercantile disclaimer is great! I'd sums it up perfectly. These items are not made in some ISO compliant first world factory. The stoves have lead washers! Please try not to lick those parts! My Liberty stoves have been functional if not cosmetically perfect. I did replace two of the pump washers after a very short time with some that I purchased on eBay. eBay seller sefaudi sells excellent hand made pump leathers for all manner of stoves and lanterns. He is in Turkey. He is a good resource for folks that like to fix a problem rather than try to get it replaced. I don't have any experience with either of the petromax clone lanterns. I have a moderate stable of coleman 288 lanterns and a large stock of #21 mantles that are easily available cash and carry from Walmart and several other stores nearby. I like the idea of a kerosene pressure lantern but I don't like the idea of hard to find mantles. I even tried to convert one of the 288's to kerosene using a 214 generator and spirit cup. It seems like it works ok but last time I had it out it lost power and was pulsing pretty bad. I'll have to fiddle with it some more. 111t, thanks for posting this excellent information and links. Although I will add that you, sir, bear full moral responsibilitiy for creating an itch which I now must scratch, once I free up some dinero. It can infiltrate every aspect of your life. 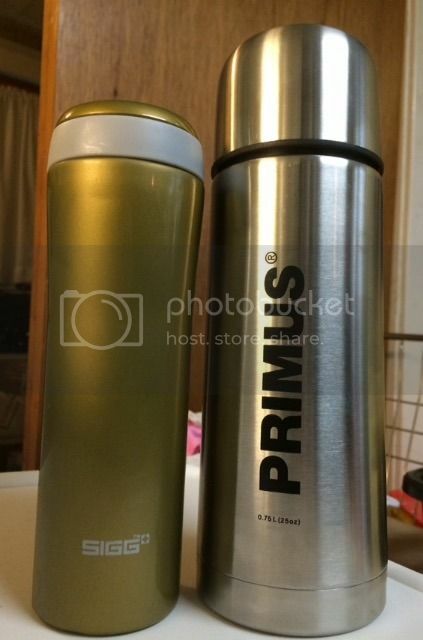 For example here is a quick snap of my travel flasks for coffee... You might expect to see a Stanley or a thermos. Nope. "Maybe yes, maybe no. If you are a lazy American or European consumer who expects every product to work perfectly, right out of the box, without even reading the instructions, please select the 'back' button above and go look at LED lanterns that run on batteries." absinthe beginner wrote: Thanks for posting this. 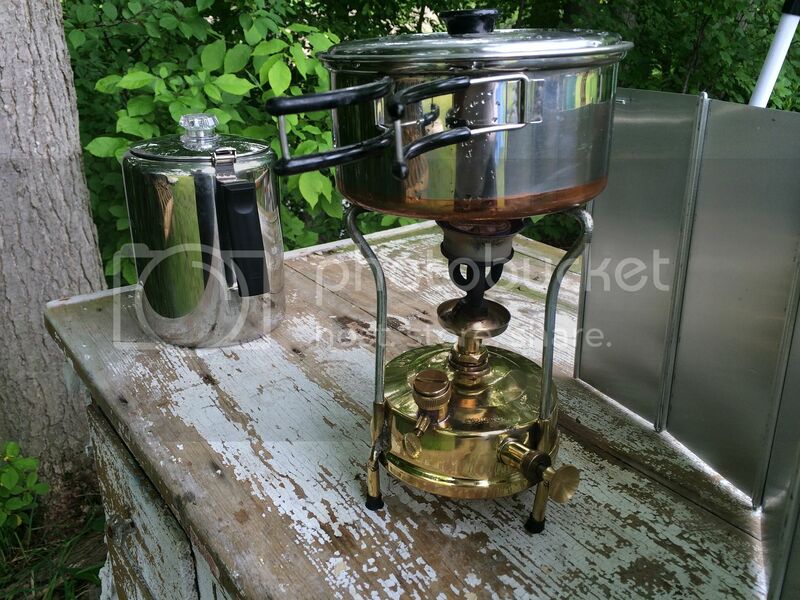 I didn't even know there was such a thing as a kerosene pressure stove. I'm well-stocked on kerosene lanterns; it seems only logical to pick up one of these as well. You might also want to look at the MSR Whisperlite internationale or the XGK, as both are multifuel stoves that happily run on kerosene. 1) price. While the international can be had for a comparable amount, the xgk is much more. The regulating stoves (omnifuel, dragonfly, nova...) are in the $150 range. 2) All of these stoves rely on a flex hose between the burner and the fuel tank. This hose is subject to abrasion wear and fire damage. Additionally they all rely on rubber I rings. Same issues. 3) The multi fuel stoves regulate by a valve and not by pressure adjustment. This is fine but it adds to the complexity and cost of the stove. The unregulated models (whisperlite, xgk, multi fuel ex...) are not as good or as responsive when it comes to simmering. There is no provision for pressure venting because it would be extremely hazardous with gasoline type fuels including white gas. A traditional pressure stove has no flex tubing to fail. The only rubber in the pressure seal on the filler cap and a very small piece at the end of the pump tube in the non return valve. This is usually thermally protected by fuel. The rest of the seals are either fiber based (asbestos substitute) or lead. Both of which age well. I'm honestly shocked to learn I was supposed to be priming these stoves with alcohol. I've always just lit kero-soaked fiberglass pad of my XGK and dealt with the smoke until it was hot. I love the optimus and indian stoves in theory but they're just too damn big and heavy for any camping I do. Self priming with kerosene is just dirtier and requires a wick. The household type traditional stoves were often used indoors. Alcohol is a much preferred priming fuel in that case. The Coleman 533 (ask any vet that did some time outside the wire in the sandbox) is a dual fuel (kero/white gas) that works well. Some older units can be converted with a new jet. 533 was never sold as a kerosene stove. The 'dual fuel ' stands for gasoline/coleman fuel. No one else draws a distinction between gasoline and coleman fuel other than coleman. While a 533 might work for a while on kerosene, the generator is not designed for it. The 550b was a true multi fuel stove with a NSN that was actually issued/is issued. No doubt the main reason these were adopted is the ability to run on jp-8. But who knows what the military has procured/issued over the years? I bought a m1950 off a vet once who said they were using it as recently as his deployment in the early 00's. They're both ok. They are certainly not any lighter than the Indian stoves.